We were back in Bombay to celebrate my Dad’s 70th birthday and much to his chagrin, I spent the better part of a day cooking with Mom to learn a couple of my favourite recipes (that she has no part in my Dad’s bonding sessions with me over single malt, was not a consideration). 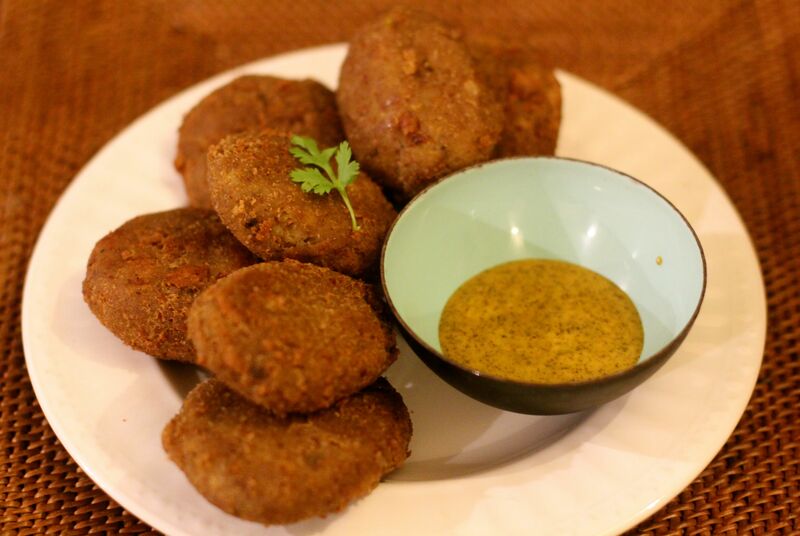 The first of these was Mochar Chop – chops made with Banana Flower (Mocha). 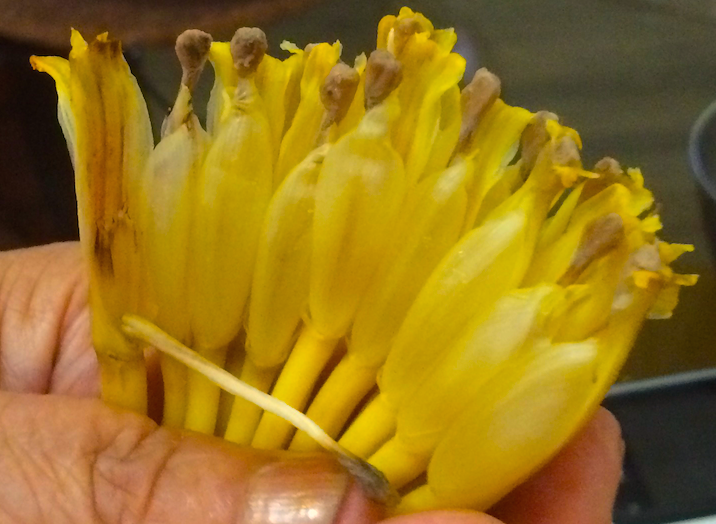 Banana flowers are a favourite of Bengalis with good reason – they are wonderfully fragrant, with great, subtle flavours. They look really pretty as well lined up in rows inside the big purple banana blossom that holds hundreds of these little flowers. Now for the bad news. They are a pain in the arse to get to. And I clearly wanted to learn to do this from scratch (and there is no way to buy cleaned flowers, so someone had to do the hard work anyway). You have to pull out the tall stigma and a plastic-like bud from each individual flower to leave behind the soft, delicious bud and stamen. So, after that patient effort (quite therapeutic), it was time to finely chop and cook the flowers into what is called a Mochar Ghonto (a mixed Banana Flower vegetable) that becomes the filling for the chop and is a fantastic vegetable dish to learn in its own right…. And then, after a night in the fridge for the filling (helps any chop by drying out some of the moisture and firming up the filling) it was time for a coating of flour slurry and bread crumbs for deep-fried goodness. You get the wonderful crunch, followed by the fragrant, spiced banana flower filling with all the garam masala, coriander and cumin flavours and the added flavours of grated coconut in the filling. They went down pretty quickly with the kasundi (sour mustard sauce) – a must for many of our deep fried chops. 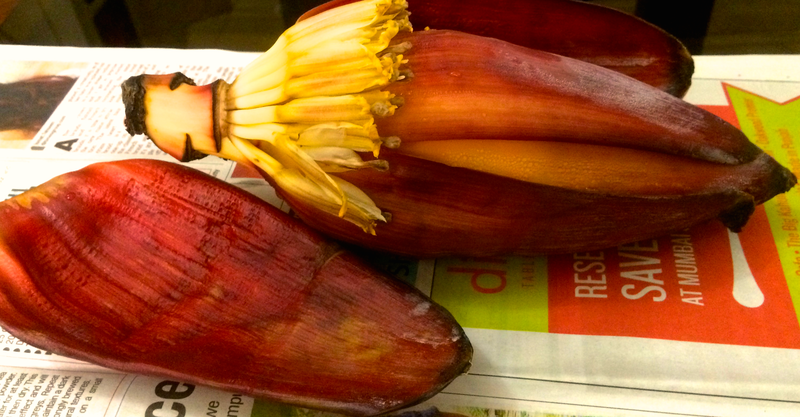 This entry was posted in Bengali cuisine and tagged banana flower, Bengali cuisine. Bookmark the permalink.